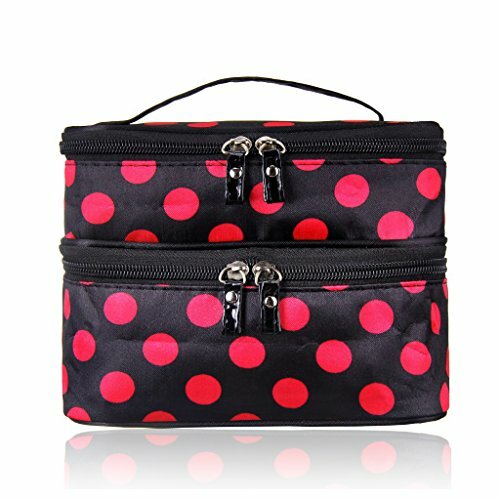 FASHION DESIGN : It Was Polka Dot Printed by Fashionable Bright Colorful Design, Featured by Zipper Closure Will Bring More Convenient When Close Or Open for Makeup,A Very Popular Makeup Organizer for Beauty Accessories. PORTABLE : With A Suitable Handle Sewed on The Lid of the Handbag, It Is Portable to Carry Everywhere ,Firm and Not Easy to be Damaged. HUGE CAPACITY :Both Layers of the Makeup Bag May Hold Big Makeup Accessories Such As Mirror Comb ,Liquid Foundation Powder ,Eyeliner ,Eyelash Curler,Lipstick,Eye Shadow and so on .the Very Creative Design is it With A Mini Mirror in It ,When You Go Out and Need Makeup ,The Mini Mirror Just Works .The Double-Deck Handbag Meets Daily Needs very Perfectly . WATERPROOF: It Made By High Quality Oxford Design ,Which Will Make It More Firm and Durable to Use .It\'s Waterproof Attributes Will Make Your Makeup Accessories Preserved Very Well.